In “The Chitters,” Supernatural gives us what’s likely to be the last Monster of the Week episode in Season 11. Though we’re eagerly anticipating the final four episodes of the season, “The Chitters” provides an opportunity to savor how well the series has honed this trope. The story was firmly rooted in the monster hunt, but a run-in with another set of hunters helped frame the story within the context of family loyalty and the hunter life. 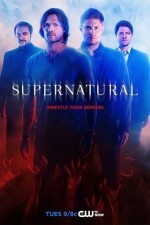 Sam and Dean investigate a case in Colorado involving the disappearance of townspeople every twenty-seven years. “The Chitters” refers to a story told to a local woman by her grandmother: “Once a generation around the spring equinox, people in town start going nuts, having orgies, copulating in the woods. And then they disappear, never to be heard from again.” The term “chitters” refers to the buzzing, rattling sound the creatures make. Sam and Dean meet a couple of hunters who tell them that these “chitters” are a cicada spirit, originating from Malaysia, known as a Bisaan. It’s a new creature for the Winchesters, so they’re fortunate to team up with this hunter couple, one of whom has had personal experience with the Bisaan when it last emerged. When Dean realizes the hunters are actually a romantic couple, he asks what it’s like to settle down with a hunter. Cesar tells him, “Smelly, dirty. Twice the worrying about getting ganked.” The introduction of the hunters allows for independent conversations between Dean and Cesar while they hunt for the Bisaan burrow, and between Sam and Jessy as they track down the previous sheriff to ask him what he found 27 years ago. “The Chitters” benefits from the horror cred of director Eduardo Sanchez, co-director and writer of The Blair Witch Project. Sanchez ensures the scenes with the chittering Bisaan are truly creepy. The camera closes in on a single figure in the woods, then the creature looks up and hisses with a glowing green-eyed glare. The scenes in the woods were particularly well-shot, but it was the moments in the mine, lit only with the hunters’ flashlights, that had the highest fright factor (Look out! It’s right behind you!). Hats off to the always amazing props team at Supernatural for the most horrible pile of bones we’ve yet seen. Nancy Won (“Thin Lizzie” and “Don’t You Forget About Me”) is quickly becoming a series regular writer, with “The Chitters” being her third episode in Season 11. She knows the Winchesters well. The dialogue between the Winchesters and the other hunters provided an added dimension to what could have otherwise been an ordinary MotW episode. Through Cesar and Jessy, the hunter couple that Sam and Dean meet, Won echoes the Winchesters’ story of family revenge, brotherly love, and sacrificing a normal life for the greater good. Jessy was played by Lee Rumohr, while Hugo Ateo played his partner Cesar. Both men were convincing hunters. Ateo played the role of a man resigned to his partner’s choices with warmth. The scenes between Ateo and Jensen Ackles, who plays Dean Winchester, showed us two strong men who understood what it means to be in the hunting life. There is some talk between Sam and Dean about adding Jessy and Cesar to the team, which helps foreshadow the coming conflict with Amara. But with the destruction of the chitters and Jessy’s revenge for his brother’s death complete, Jessy and Cesar are looking forward to retiring to a ranch in Texas. They are done, and, unlike most hunters, they have survived—at least so far. As much as we enjoyed Jessy and Cesar, we were glad to see Dean let them go on to retire from the hunter life. As Dean says, “Two hunters who make it to the finish line? Yeah, you leave that alone.” Is there a finish line for the Winchesters? Is Sam going to hit another dog? Among other things, “The Chitters” was a good example of how well Supernatural does horror. The skilled cast and crew can make the difference between an interesting story and a heartfelt horror story. Like Dean, Castiel and Amara are still very much on our minds, but “The Chitters” gives us a well-done Monster of the Week episode that we can really sink our teeth into.